While Spalding's co workers mutter about his untimely demise Lois-bot is busily monitoring data. Lex is also surprised the drone he stole from Brainiac wasn't reporting her finds on the black sphere energy. They have now firmly tracked all the Black Lantern energy and Lex's quest is almost over. At this moment Larfleeze, the Orange Lantern, and his 'pet' energy constructs attack Lex and his base of operations. Apparently, Glomulus, one of the constructs had found and eaten one of the spheres. Glomulus is ill from the containment so Lex offers to help by taking possession of the sphere. A fight ensues and when the Orange Lantern takes a hostage, yet another Lexcorp employee dies, at Lex's hand. The battle turns in favor of Lex and Larfleeze is swallowed up like Spalding into the Black Lantern sphere that had converted itself to white. Lois-bot tries to convince Lex to convert the energy of the other space bound black spheres remotely but Lex prefers the personal touch and readies a plan to retrieve the spheres. ...so do we, unbeknownst to Lex, Brainiac's Lois-bot has been secretly working for Brainiac all along. Story - 1: Wafer-thin plot that didn't really move any further on the plot reveals that we discovered from part six onwards. How one of the greatest minds on the planet hasn't figured out he didn't format Lois-bot correctly is beyond me. Moreover nine months into the story and it's still not ramping up. I am not a Larfleeze fan, sorry, if I were maybe I'd be more forgiving? But truly aside from guesting yet another character in this drawn out saga it added nothing to the mix. Art - 3: The art sticks to the numbers, no real story to go with, so Woods happily occupies the space with a crash, bang, wallop between Lex and Larfleeze. It's great to look at but it still fails to add weight to the chapter. 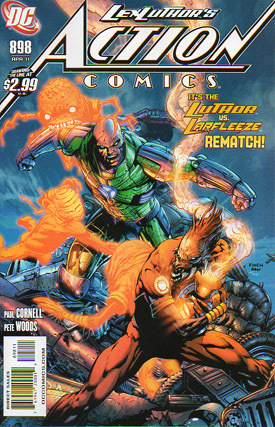 Cover Art - 4: The fight between Lex, Larfleeze and the constructs is the high point of the book. The color clash of the orange hues and glow flares work to great effect against the deep blue. I'm backing Larfleeze in this fight!